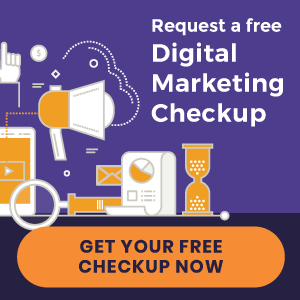 We talk a lot about chiropractic website design and what makes a website “conversion-friendly,” but today we thought we’d show you. 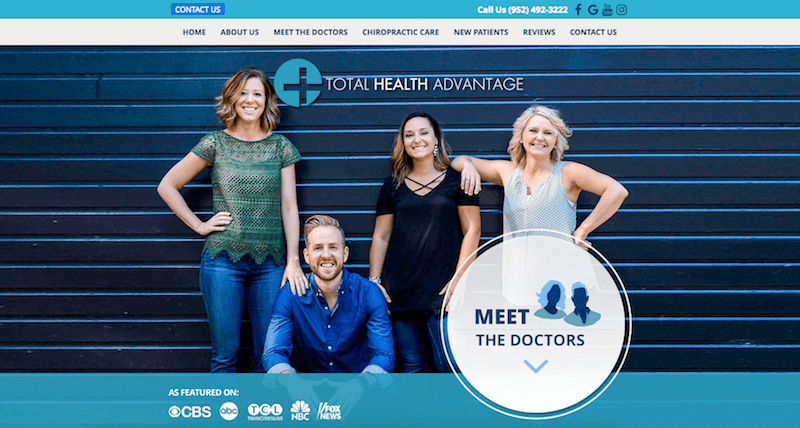 Here are five awesome chiropractic website designs along with explanations of how the designs will help the doctors get more new patients. What’s the first thing you notice when you look at this site? It’s the photo, right? That big professional photo of the Total Health team immediately grabs your attention. They are welcoming you to their practice by putting themselves front and center. They know that choosing a chiropractor is an important decision and that they need to earn the trust of their prospective patients. Studies show that photos of the business owner on the business website inspire more trust in visitors than stock photos or no photos at all. Which is why we strongly encourage our clients, like Total Health, to showcase professional photos of themselves, their office, and staff on their website. When you visit the Hanson Family Chiropractic website, you know exactly what Dr. Hanson specializes in – pediatric and pregnancy care. From the content to the photo of the doctor with his own family, you know that this is a family place. And that is important when trying to choose a chiropractor for your precious little ones. Visit the Office Tour page and you’ll see professional photos of the office, including staff members and patients – happy kids playing with office toys. The content explains their philosophy. 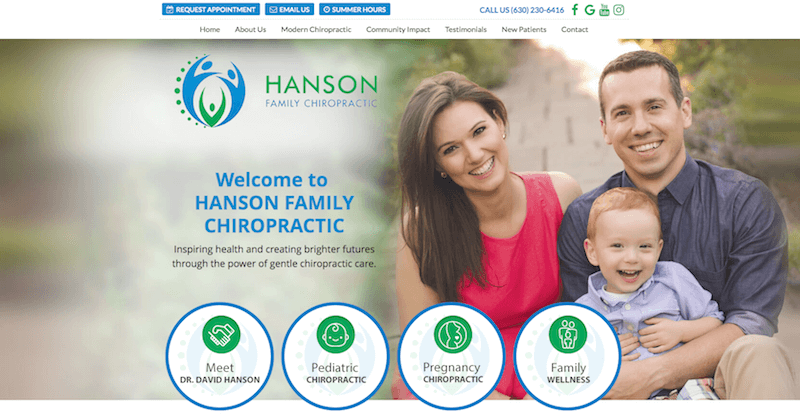 All of this combines to create a website that will attract Hanson Family Chiropractic’s ideal patients. 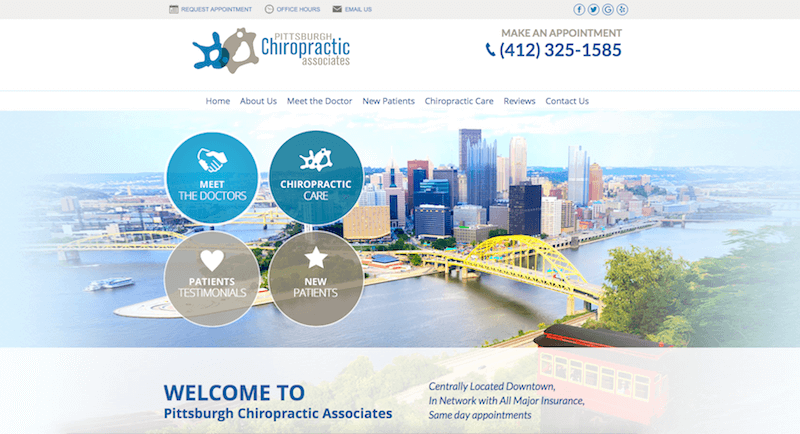 The Pittsburgh Chiropractic Associates website is a clean, modern design. From the photo of the cityscape to the white space to the abstract practice logo, this website design is appropriate for a chiropractic office located downtown in a busy city. The call-to-action (“Make an Appointment” and phone number) is hard to miss and the buttons leading to the important pages (Meet the Doctors, Chiropractic Care, Patient Testimonials, and New Patients pages) are front and center so that busy city dwellers can quickly find the information they need. 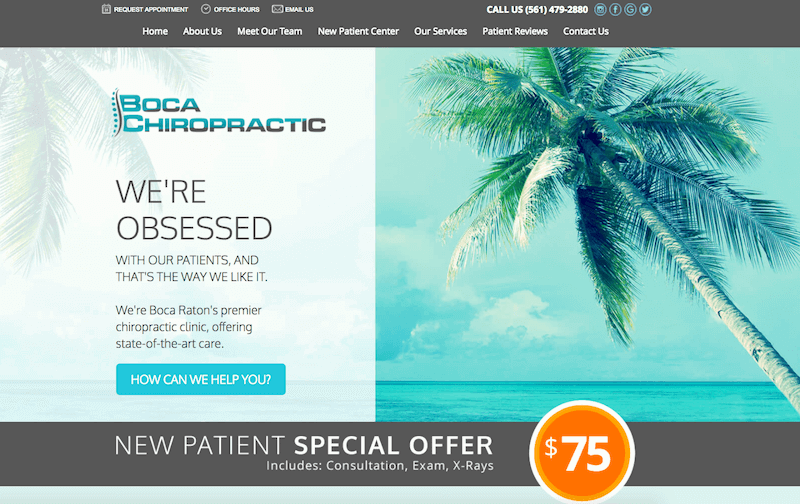 When prospective patients visit the Boca Chiropractic website, they aren’t inundated with too much information. Instead, they’re greeted by a serene image and clear calls-to-action. A prospective patient who is ready to begin care immediately will be drawn to the “New Patient Special” while someone who is still in the research stage may click on the “How Can We Help You?” button. Did you know that 91% of consumers check out online reviews when looking for a local business online? And that 84% trust online reviews as much as they trust personal recommendations from friends and family? 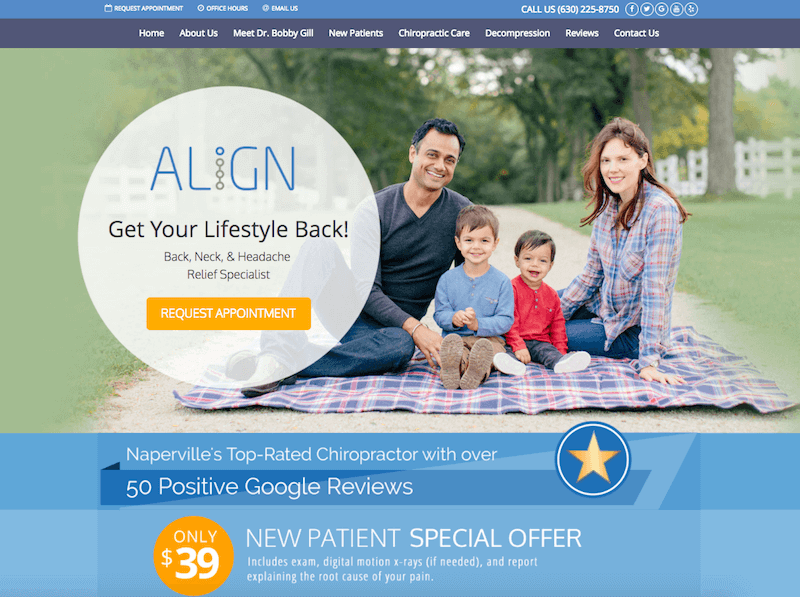 Align Chiropractic knows the power of social proof. With over 50 positive Google reviews, they’re able to let their current patients “sell” their prospective patients on their services by linking to the reviews right on their homepage. Another conversion-friendly aspect of this website design is the content in the main banner. There is a clear statement of the doctor’s specialty (“Back, Neck & Headache Relief Specialist”) with a clear call-to-action to “Request Appointment.” Prospective patients ready to schedule an appointment don’t have to think twice about how to get in contact with the practice. And that’s just the way it should be! If your practice website isn’t converting new patients, it may be time to upgrade. Check out our three service plans to see what Perfect Patients can do for you.